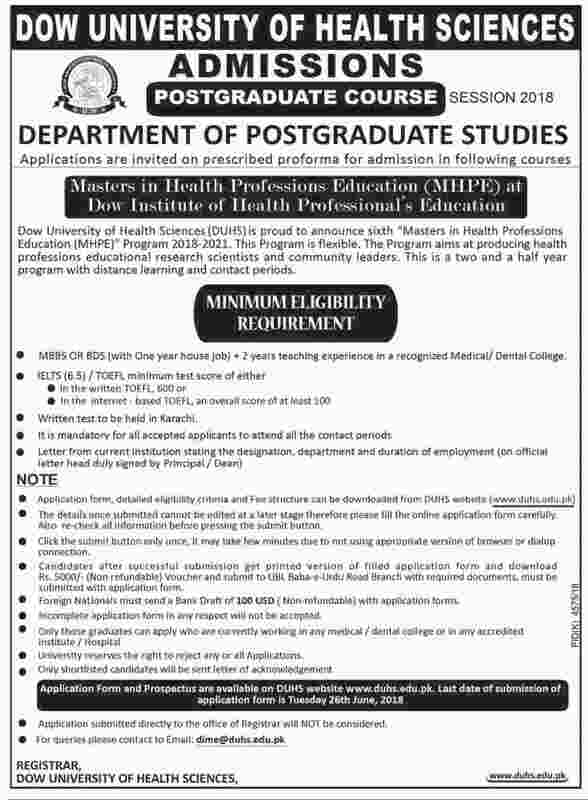 Dow University of Health Sciences (DUHS) Karachi Admission 2018 last date and Entry Test date is announced. Admissions will be opening in undergraduate and postgraduate degree programs. Applications are invited for admission into MBBS, BDS, BS-DCP, Doctor of Pharmacy (Pharm-D), BSMT, BSPMR, DPT, BS NUR, BBA, FCPS, MBA, EMBA, Masters in Nursing, Dental Surgery, Diabetics, Biostatistics, Physiotherapy, MS, MPhil and Ph.D. in different subjects. The last date to receive admission forms is mentioned in the advertisement. Eligibility criteria for admission, admission guideline and necessary academic documents which are required to be submitted with the admission form are also described in the admission advertisement. Here you can get information about how to download admission form, DUHS fee structure, eligibility criteria, entry test, selected candidates merit list, scholarships and financial assistance programs at DUHS. DUHS is a well-known institute of its kind in the field of medical science and healthcare. It is founded in 1945 as Dow Medical College named after the second Governor of Sindh Sir Hugh Dow. DUHS Karachi is pleased to announce the admission into different courses for spring and fall semester. At the same time, University of Karachi Admissions are open so you can check out that also. The admission notice for admissions into different study programs and courses at DUHS is published in prominent national newspapers mentioning the different subjects to be offered and admission requirements for enrollment into degree programs of various levels. DUHS Last date of form submission: 26th June 2018. Looking for getting admission in Karachi Top Universities? Have a look at these universities for complete details MAJU Karachi, Fast (NU) National University Karachi, Iqra University Karachi. Dow university conducts entry test and aptitude test for admission into different degree programs for shortlisting the eligible candidates for admission. Candidates have to qualify the entry test by securing at least 50% marks in the test to appear in the interview. Entry Test Date: 06 June 2018. DUHS Karachi admission advertisement is available on the website as well as in the electronic and print media. Admissions are opened for the year 2018 in different departments. Details about admission form download, fee, eligibility requirements, entry test schedule are mentioned in the advertisement. DUHS Fee structure is very much affordable as compared to other institution of the medical field. Admission fee, processing fee, semester fee, examination fee and thesis fee is mentioned on the university website and you can also take information about fee structure from admission cell. Fee structure of Dow University can change from time to time with the approval of the administration. DUHS admission application is submitted online at official website of the university www.duhs.edu.pk.To apply for admission online Click Here to get the online admission form. Fill the admission form carefully and get out the print of it. Aptitude test is carried out on the main campus of DUHS Karachi. Please bring the all academic certificates, degrees in original at the time of the interview with 3 passport size pictures. Short courses at Dow Institute of Radiology are now open for postgraduate session 2018-B. The last date for submission of application form is 26th June 2018. The entrance test will be held on 6th June 2018. Eligibility criteria and admission requirements for getting admission at DUHS are same as approved by the HEC for different degree programs. For getting admission into the undergraduate program, the candidate must qualify intermediate with an at least first division. For getting admission into master degree program Bachelor degree with at least 60% marks or 2.5 CGPA is required. Entry test is compulsory for admission at DUHS. Merit list of successful candidates is displayed in the main campus of DUHS and on the official website of the university www.duhs.edu.pk. Candidates can check their merit from the list and successful candidates are offered admission at DUHS.